Mid week trotting through DLF Galleria - CHOMP! SLURRP! BURP! My first visit to DLF Galleria, almost a year and a half year back now, left me slightly in awe of the whole place. Gobs of awesome little cafes, boutiques and big brands, street whips and the signature fountain. House to Chaayos for innumerable cups of chai, work space and now open 24 hours, is one our go to places. Hit Le Marche – Sugar and Spice for some fresh breads, sweet and savory sandwiches, and Fat Lulu’s has to be your take away crafted pizza joint. Theobroma adds another feather to the cap with Oreo and Red Velvet brownies. 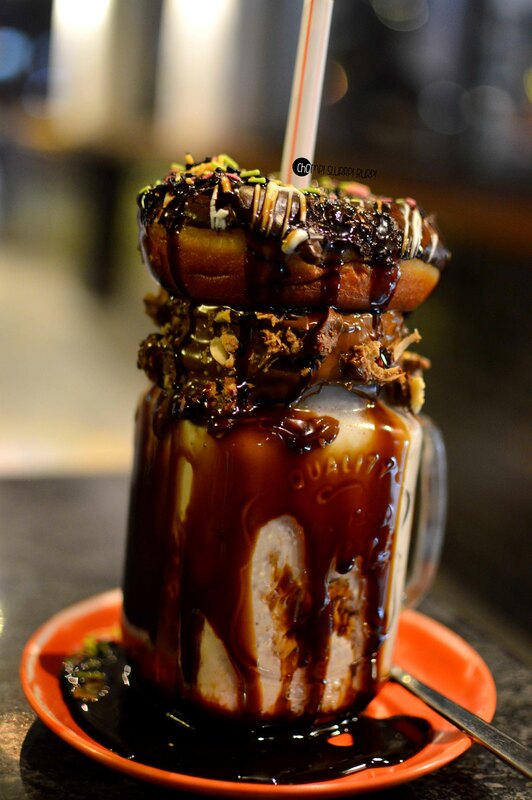 One of the largest owned space at Galleria is AmPm Cafe and Bar – with their signature Lickable shakes, cocktails by Yangdup Lama and irresistible fusions, this is one of the coolest places foe live music and a evening of unwinding. Also home to a lot of street food options, we tried a single chicken, single egg roll from Kwality’s – the roll was pretty decent – a nice, soft flaky parantha, with a layer of egg and juicy chicken bits, onion rings and sauces. They could have definitely added some more dressing for flavors, but it makes for a pretty good cheap bite. Our star find was Piccolicko – a cute little dessert parlour serve Italian gelato in exciting flavours, waffles, shakes and ice creams. We tried their chocolate fudge cake and butterscotch caramel cake scoops – the chocolate fudge cake a sinful delectable piece although I found solace in the butterscotch caramel cake – with crunchy butterscotch bits and a sweet and sticky caramel flavor. Topped with a waffle cone, three scoops set you back about 200 INR and although the ice cream is incredible, the scoops are a tad small to do the price justice.